Communities@Work today celebrated the official opening of the second campus of their Galilee School. The construction was jointly funded by the Australian Government under the Capital Grants Program and Communities@Work. The purpose-built facility in Holder has adapted contemporary learning and teaching spaces which are open-plan, allowing for the natural flow of light and discussions between teams. Spaces within the building allow for a mix of teaching and learning styles to be accommodated. 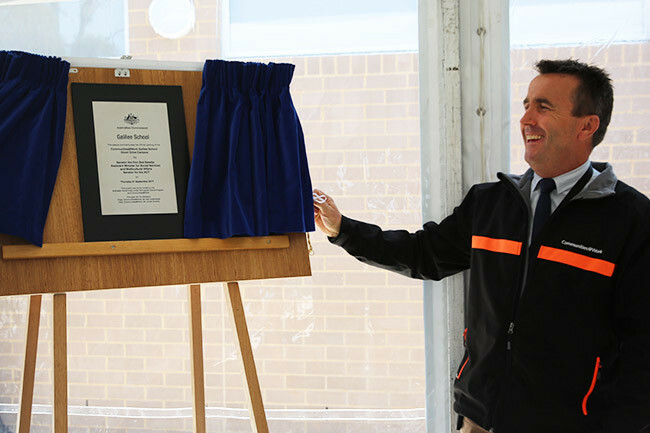 Principal Tim McNevin said the new space offered an academically-focused yet flexible environment specifically for the Year 10 students, while students in Years 7, 8 and 9 are based at the first campus in Kambah. “We aim to build resilience and empower all our students. It is also important to us to support and prepare our Year 9 and 10 students as they transition into further education, training or the workforce,” he added. Students demonstrated the skills they have been garnering from an ongoing Canberra Institute of Technology course by making mocktails for guests at the launch. “We scaffold our students learning with training and skills development, as well as offering job-ready support,” Mr McNevin said. Communities@Work CEO Lorcan Murphy said that the new campus reflected the dedication of the organisation to support disengaged and vulnerable young people with education. Communities@Work’s Galilee School is a registered, independent secondary school designed specifically for disengaged and vulnerable young people in Years 7 to 10 in the ACT, for whom the mainstream schooling environment has struggled to deliver positive learning outcomes. Galilee School offers a supportive and flexible learning program, run collectively by highly skilled educators and youth workers, that aims to meet the individual needs of each student.